Hi, I am interested in your 1988 Rolls-Royce Silver Spur (stock #4673-ATL) listed on Autotrader for $33,995. I'd like to get more information about this vehicle and confirm its availability. 30 plus years old and its magic is still very much intact! The unmistakable, opulent look of a Rolls is always guaranteed to turn heads. Its a nameplate as strongly linked with unbridled luxury as likely any consumer brand has ever been, and this 1988 Rolls-Royce Silver Spur is one exceedingly fine example of its manufacturers automotive artistry. Its logged an unusually low 61,000 miles during its lifetime, so its well positioned to offer its rolling grandeur for many future miles to come. Dressed in black to further reinforce its luxurious formality, its a great looking ride. While the color can be a mixed bag as the high impact look it provides often comes with the drawback of amplifying any imperfection present, there are no such worries here - this Rolls has obviously been driven with care and consistently sheltered when not in use and a thorough detailing will have it looking its best. The sheer magnetism of a Rolls in its natural state is more than enough to discourage any aesthetic experimentation, so this 88 thankfully remains in its stock configuration. From that instantly recognizable chrome grille with its vertical bars and prominent hood ornament on back to the wraparound rear bumper, the assembly of chrome on board is in excellent shape and the spacious cabin is capped by a vinyl roof that still looks very fresh and supple, with not a hint of bubbling in sight. Just slipping behind the wheel of this luxury icon is enough to elevate your self-image to a new level. The tan interior is in top-notch condition, with front buckets that offer sofa-like comfort combined with plenty of support and rear seating with an outstanding amount of legroom. Your backseat passengers will have the added convenience of fold down trays and carpeted footrests - this is a Rolls, after all. Theres a generous use of burlwood accenting throughout the cabin - across the tops of the front and back doors, over the top of the center console as well as across the expansive dash area - and all of it presents very well. The dash area is another definite high point for this Silver Spur - not just as far as its aesthetics, but as far as its level of functionality as well. The assortment of gauges works just as intended and every control switch still has a fresh glow. Comfort features include cruise control, power windows and door locks, power seats, air conditioning and an AM/FM/cassette stereo to lend its vintage technology to your time behind the wheel. This is an expansive, substantial sedan that requires a potent powerplant and the fuel 6.75 liter V8 underneath the hood is certainly that. Its in great running condition - Rolls Royce is known for their longevity, and the relatively light mileage this one has seen so far combines with plenty of attentive care over the years. It sits in a very nicely detailed engine bay and pairs with a smooth shifting automatic transmission to offer just the high-functioning driving experience youd expect from the brand. With independent suspension at both ends coupled with Rolls self-leveling technology, the ride on this 88 is impressively smooth yet firm enough to not detract in the least from its surprising agility. The power steering is nice and responsive, while the power disc brakes at all four corners bring prompt, reliable stops. This renowned luxury sedan rides on a set of 15 original factory wheels outfitted with Kumho tires that appear to have plenty of tread left. 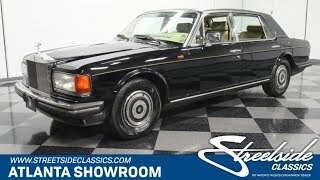 This 1988 Rolls-Royce Silver Spur offers the unusual opportunity to get behind the wheel of one of the worlds most evocative cars thats in great shape and comes at an equally great price. Call today!